Dallas, TX - One of just eight Famous Funnies covers by the legendary Frank Frazetta and an unrestored Superman rarity are expected to headline Heritage Auctions’ Comics & Comic Art auction Feb. 21-23 in Dallas, Texas. Frank Frazetta Famous Funnies #209 Cover Original Art (Eastern Color, 1953) is one of just eight covers for the title by the hugely popular artist. With a pre-auction estimate of $300,000+, this is one of the most coveted Frazetta covers for any comic. The image is a prime example of why the artist is revered for his ability to draw women, and of the 1950s-esque “retro” style that is so popular among many collectors. An image like this is extraordinarily rare - the last time Heritage offered a Frazetta Famous Funnies cover was 15 years ago - which understandably fuels the demand among collectors. Superman #1 (DC, 1939) CGC VG+ 4.5 Cream to off-white pages (estimate: $300,000+) is an exceptionally popular issue, the first in one of the most popular titles in comic history. Considering the issue is nearly 80 years old, nearly all known copies are restored, but the allure to collectors for this copy is due in part to the fact that this one is not. Superman #1 hit the newsstands after his debut in Action Comics #1, boosting the Man of Steel’s popularity to new levels. This issue marked the first time a character created for comic books was given his own title. Roughly a million copies were printed in 1939, but very few are known to have survived at this grade or higher, making it a must-have issue among serious collectors. The issue is ranked No. 3 on Overstreet’s “Top 100 Golden Age Comics” list. The Incredible Hulk #1 (Marvel, 1962) CGC VF/NM 9.0 Off-white to white pages (estimate: $200,000+) is an exceptional copy of the second-most valuable Silver Age issue. Copies with such a high grade are nearly impossible to find, and this issue with the origin and first appearance of the Hulk is inarguably a highlight in the auction. The issue also features the first appearances of supporting characters Rick Jones, Betty Ross and Thunderbolt Ross, and features art and cover by Jack Kirby. One of the most dramatic images in the auction is Dave Gibbons Watchmen #1 Cover Original Art (DC, 1986) (estimate: $200,000+). Among the most influential and iconic comic series of the 1980s, Watchmen by Gibbons and Alan Moore had a lasting impact on the industry. The cover of the first issue remains one of the most recognizable images in the series, with the drip of blood on the smiley face button reminiscent of the hands of a clock striking 12 as “time running out” was a recurring theme throughout the series. Another bold, dramatic image is found on the cover of Journey Into Mystery #83 (Marvel, 1962) CGC NM 9.4 Off-white to white pages (estimate: $200,000+), featuring the origin and first appearance of Thor, who is billed on the cover as “The Most Exciting Super-Hero of All Time! !” This copy carries one of the highest grades known to exist, and is the highest-graded issue offered by Heritage in three years. No. 6 on Overstreet’s “Top 50 Silver Age Comics” list, this issue is considered one of the four most legendary “origin” issues of the early Marvel Age. 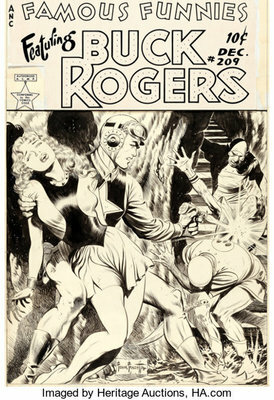 The cover is by Jack Kirby, who collaborated with Steve Ditko on the issue’s art.